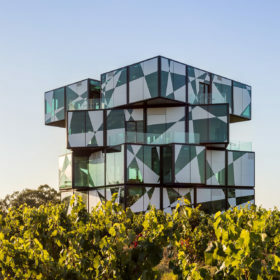 From reimagined historic buildings to cutting-edge tasting rooms, we look at the spaces and architects giving the wine industry a much-needed makeover. In all relationships, first impressions matter. For a winery tasting room, the goal is to set the stage for the experience to follow. The best-designed tasting rooms express the winery’s spirit, engage the senses and entice your imagination. Here’s a selection of tasting rooms that forge powerful connections between design and wine. A broken-down 1930s gas station was an unlikely inspiration for the winemaking duo of James Harder and Jim Regusci. Fear of winery decorum norms didn’t slow them down. “At its core, Tank is a celebration of vintage California,” says Harder. The gas station was once owned by Eddie Bratton, a renowned Indian motorcycle mechanic and daredevil racer, and the tasting room’s design embodies a youthful, rebellious spirit. A 40-foot glass door rolls up to reveal the Lubrication Bar, where Bratton’s red 1947 Indian Chief is on display. There’s also a secret back room for members, with velvet walls and twinkling chandeliers reminiscent of a Prohibition-era speakeasy. “Younger consumers don’t want to go to mom and dad’s tasting room,” says vonRaesfeld. A former 1930s Coca-Cola bottling plant serves as headquarters of McPherson Cellars. It was a family project for winemaker Kim McPherson and his wife, Sylvia, an experienced interior designer and landscape architect. “We are part of the redevelopment program for the historic depot district of our downtown, and some of the first to open up new businesses in the area,” Kim explains. The long brick building was a familiar local landmark. Its distinctive streamlined features appealed to the McPhersons, like the extensive plumbing and wastewater infrastructure left from its Coca-Cola past. Curvy tables, benches and sofas repeat the theme. The structure’s original materials like its brick, cinderblock and windows were preserved and refurbished, and complementary new elements like polished and sealed concrete were added. Pops of color keep with the building’s history, and the design’s overall effect is retro-modern industrial. It’s not surprising that Charles Smith, a self-taught winemaker who once managed rock bands, would take a bold approach to wine tasting. 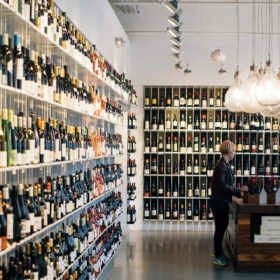 “Charles’s philosophy is, ‘It’s just booze—drink it!’ and he wanted to capture that rock ’n’ roll feeling in the space,” says architect Tom Kundig, owner and design principal at Seattle’s Olson Kundig. Smith set his sights on Walla Walla’s former Johnson Auto Electric building, built in 1917. The revived structure is designed to be both rough and ready. So they left the interior raw and open, retained the original brick walls that came complete with old scribbles, as well as its concrete floors and wood trusses. They added tables made of timber and steel, and also a bar. Along with a prefabricated 70-by-20-foot office shell nicknamed “the Armadillo,” there are floating “rafts” to support seating or a stage, interlocking tasting tables and a sliding panel that doubles as a video screen. “It is a living, breathing thing that is in harmony with my wine,” says Smith. From the road, it may look like a stylish but otherwise ordinary big red barn in the middle of a green field. But the Red Barn at Mission Hill Family Estate houses a sophisticated viticultural tech center with a glass-walled tasting room hidden in the back. “We wanted it to stand out without people thinking it looked out of place,” says Darryl Brooker, general manager of Mission Hill. The tasting room is simple, rustic and bathed in natural light. “It is really just a glass box in a vineyard,” says the architect, Tom Kundig. “We wanted the space to be restrained and without any noisy elements, so there would be no distractions from the wine. An indoor table seats 30, while outdoor seating under a vine canopy and a full commercial kitchen allow year-round flexibility. One of multiple separate tasting spaces at Mission Hill, the Red Barn has an educational focus. It brings visitors right into the vineyard for lunch or a tasting among the grapes. That’s the question that Thomas Robinson, founder and principal of Portland’s Lever Architecture, faced when he began to design a tasting room for Oregon’s L’Angolo Estate. The solution? Start with the land itself. With a distinctive roofline inspired by the spreading canopies of Willamette Valley’s native oaks, the building takes the form of a welcoming natural shelter. “We wanted to join our love for the clean lines of modern architecture with the utilitarian shapes of the agricultural buildings dotting our landscape,” says Gray. The two wing-like roof planes artfully intersect and appear to float above the light-filled tasting room. Giant sliding glass doors offer open circulation to the vineyard and an outdoor seating area equipped with a fireplace. The interior’s concrete counters and floors, and a blackened steel bar keep the focus on the wine. “Meticulous craft and attention to detail are hallmarks of our winemaking approach as well,” says Gray. To step from the bright sunshine into TarraWarra’s Cellar Door is a little like passing through the rabbit hole from Alice in Wonderland. Melbourne-based architect Kerstin Thompson created an inward-focused underground space with dramatic lighting and spare décor. A 30-foot-plus concrete tunnel adjoins the space and influences both the tasting room’s shape and style. The designers added a wood texture to the concrete to soften its impact. They also used recycled timber from St. Andrew’s pier for the bar and tables. “We wanted to add some warmth so that it was less industrial and more inviting,” says Halloran. The large space can be divided to accommodate groups and provide privacy for special tastings, dining or meetings. Bold lighting that includes striking natural light chimneys help break up the space. “This helps when you have a number of groups in there, so they feel a sense of intimacy, even though it’s one long tunnel,” says Halloran. Mike McCabe, principal of San Francisco’s Walker Warner Architects, was tasked to design three small tasting pavilions that provide vantage points across the vineyard from the shelter of dense oak woodland. Each 250-square-foot pavilion is built from materials that harmonize with the natural setting of board-formed concrete walls, reclaimed cypress ceilings and casework, with local Napa Syar stone retaining walls. McCabe says that he used “some structural magic” to produce very thin roofs with broad overhangs. In combination with elements that can open, slide and pivot, the pavilions have the flexibility to function both as shade structures as well as fully enclosed buildings. Interior designer Maca Huneeus, who is married to Agustin Francisco, used spare, minimalist furnishings to keep with the simplicity of the structure. The sturdy, sculptural tables and benches are made from sustainable Afromosia wood.